Powers/Abilities: No super-powers known, but he probably has some unknown, unrevealed mutant "luck" power that kept him alive and unharmed, gaining him his victories. He features a complete inability to pilot his fully automated Frog-Man suit. He’s very lucky - if he wasn't, he'd be dead. His equipment is a frog suit equipped with electric leaping coils, as well as an internal computer to pilot the suit. His weapon is his body. Not that he's a good fighter, just that he jumps so clumsily that he usually rams his opponents inadvertently. History: Vincent Patilio was a failed scientist, whose first breakthrough were the leaping coils he would wear in his Leap-Frog suit. He became a super-villain, but after a number of failures, he decided to retire as a villain. Enter Eugene: his son. (Spectacular Spider-Man II#185 (fb)/OHotMU 2006#4 - BTS) - Eugene was fairly young when his mother died of breast cancer. (OHotMU 2006#4 - BTS) - Eugene was placed in the custody of his father's sister Rosemary. Eugene adopted his uncle's name in hope he wouldn't be recognized as the son of Leap-Frog. His uncle Gus passed away soon afterwards. (Tangled Web of Spider-Man#12/OHotMU 2006#4 - BTS) - When Eugene was in high school, his dad was released from prison and moved into Marie's house, and planned to go straight, though both he and Eugene were haunted by mocking from his previous Leap-Frog career after his father's identity was revealed on TV (they incorrectly used Eugene's false name and made everything worse for Eugene). Vincent got a job selling cars, in costume, as "Frog-Face," who was clocked in the back of the head by a baseball bat for comic relief. Eugene was teased and even beaten up at school. Spider-Man paid Vincent a visit, warning him to go straight. Desperate to get some respect for his father's name, Eugene put on his second costume, and tried to bust up some loiterers, who easily beat him up. Vincent drove up and scared off the nefarious loiterers. (OHotMU 2006#4 - BTS) - Vincent moved with Eugene out of his sister's house into an apartment uptown. (Marvel Team-Up I#121) - A few months later, fifteen year old Eugene--having apparently gotten over his previous beating--decided to again try to gain respect for his father's name. He put on one of his father's original-style costumes and went out to find some crime to fight. He saw Spider-Man and the Human Torch having minor trouble dealing with Speed Demon. He attacked and defeated Speed Demon in a clumsy move. Call it delusions of grandeur, but Eugene actually saw some merit in his victory, so the Fabulous Frog-Man had come to stay! Vincent didn't like the idea of his son getting in danger, though. (Marvel Team-Up I#131) - A few months later, he heard that the White Rabbit was busting fast-food chains, so he waited for her in Kwikkee Burger. He clumsily attacked her gang when they came in, and Spidey saved his sorry--hide. The Rabbit fled, but eventually events turned into a three-way fight between Spidey, the Rabbit, and the Frog, ending with the Rabbit crashing down. (Amazing Spider-Man I#247) - He also dropped in when Spidey was fighting Thunderball and four thugs, inadvertently allowing the bad guys to escape. (Defenders I#131) - Next, the Frogman was denied membership into a group that didn't even have members--the Defenders. The Walrus appeared and attacked the non-team, and the Frogman watched as the Walrus collapsed from indigestion (too many Kwikkee Burgers) and got the credit for the win in turn. (Amazing Spider-Man I#266) - Later, Spidey joined him alongside Spider-Kid and Toad. Froggy joined the latter two, forming a "super-team" the Misfits. (OHotMU 2006#4 - BTS) - The Misfits disbanded almost immediately when the Toad returned to his criminal ways. Vincent and Eugene moved back into Marie's house. (Marvel Fanfare I#31-32) - The Misfits didn't last long, and Frog-Man was solo again, this time "helping" Captain America against Yellow Claw and his mutations (some of them were giant frogs). (OHotMU 2006#4 - BTS) - After graduating from high school Eugene worked briefly for Damage Control. (Damage Control II#2) - During the Acts of Vengeance, Frog-Man received repairs on his left boot from Gene Strausser at Damage Control. (OHotMU 2006#4 - BTS) - Strausser further improved Frog-Man's suit. Eugene himself became skilled with computer technologies, designed an exo-skeleton for the Frog-Man suit as well as a computer guidance system. Eugene returned to his father on a week vacation from school and went on patrol in his old Frog-Man suit. 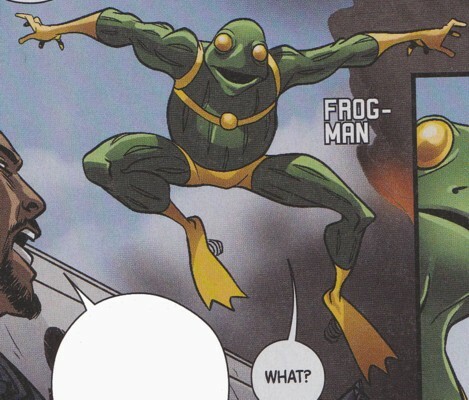 (Marvel Illustrated: The Swimsuit Issue) - Frog-Man participated in the 800 meter hurdles and high jumps in the Maria Stark Foundation's Super Olympics. He ended up winning the the bronze medal. (Spectacular Spider-Man II#185) - Now in college, Frog-Man invited Spider-Man to dinner. During a dinner at his house, they watched a news bulletin that said that the White Rabbit and the Walrus were on a rampage. (They were trying to draw-out Frog-Man in order to get even with him. Speed Demon and Yellow Claw felt that a team-up with the White Rabbit was insignificant, but at least they got a good laugh before refusing.) Spidey left. Vince prohibited Eugene from leaving and exited as the Leap-Frog, but Eugene followed him as soon as his father's back was turned. The Walrus knocked down Spider-Man with his laugh attack (he says dumb things, others laugh, and he strikes while they're distracted). Vince arrived and announced himself as Frog-Man, the Walrus attacked, Vince knocked him down, the White Rabbit moved in to kill Vince, and then the real Frog-Man arrived, bouncing clumsily and falling on the Rabbit's back, taking her out of the fight in the process. Spidey took care of an enraged Walrus, and Vince finally approved his son's crime fighting activity. (He should--Eugene is luckier than Longshot [lucky mutant from the x-titles]. Well, he's even luckier than that pesky Donald's cousin, Gladstone Gander [lucky duck from the Disney titles]). (Civil War: Battle Damage Report) - Tony Stark considered Eugene as a potential Initiative recruit. (Punisher War Journal II#13 (fb) - BTS) - Frog-Man was captured by Kraven the Hunter (Alyosha Kravinoff), who sought to build a zoo full of super-powered animal-themed villains. (Punisher War Journal II#13) - Frog-Man was kept in a cage. (Punisher War Journal II#14 (fb) - BTS) - Frog-Man was kept with Rhino, Bushmaster, Mandrill, Kangaroo (Brian Hibbs), Aragorn, Vulture (Adrian Toomes), Mongoose, Man-Bull, Dragon Man, Frog-Man, Swarm, and Grizzly. The animal-themed villains were kept in cages aboard a ship with bombs around their necks to keep them from escaping. Kraven was a cruel keeper, feeding them only occasionally. (Punisher War Journal II#14 - BTS) - Kraven killed Aragorn and fed the horse to the prisoners, who refused to eat. Later, Kraven used his skills and potions to drive all the captives into bestial rages. He set them loose on his sinking ship to attack the Punisher (Frank Castle). Tiger Shark approached Punisher first. (Punisher War Journal II#15) - Frog-Man was hunted down by Kraven on the ship and desperately tried to explain that he wasn't a frog. He was seemingly slain by Kraven with a harpoon. (Avengers: The Initiative#19 (fb) - BTS) - Eugene was abducted and replaced by Skrulls. (Avengers: The Initiative#7 (fb) - BTS) - The Frog-Man imposter became a member of the Initiative's Action Pack. (Secret Invasion#8 - BTS) - Eugene returned to Earth with all the other abductees. (Avengers: The Initiative#20) - At Camp Hammond Eugene participated in a Post-Abduction Readjustment meeting overseen by Doc Samson and Alicia Masters. (Web of Spider-Man II#1/3) - Frog-Man jumped at Kangaroo from behind after Spider-Man had already knocked out the armored villain and claimed victory over him. Frog-Man once again tried his best to convince Spider-Man to become a crime-fighting team pointing out how much he had improved as a costumed hero. Spider-Man was annoyed and distracted and after knocking out Kangaroo once again and webbing him up left while Frog-Man had to endure his own wanna-be sidekick the Tenacious Tadpole, who was even more annoying and useless than Frog-Man ever was with an armless costume with a tad-tale and slime excreted from the costume. Tadpole was glad when Spider-Man was gone while Frog-Man would've rather hung out with Spider-Man than his fanboy. (Fear Itself: Youth in Revolt#1) - When the Serpent (Cul) began his reign of terror on Earth, Steve Rogers commissioned Prodigy to reassemble the Initiative to handle the fear-induced rioting that was spreading across the country. Frog-Man was among the Initiative members who gathered in Washington DC to rejoin. (Fear Itself: Youth in Revolt#2) - Frog-Man joined Geiger, Firestar, Scarlet Spider and Gravity to deal with fires in New Jersey. When Frog-Man encountered a SWAT team outside a building he learned they had been chasing a Raft fugitive and were dealing with a hostage situation. Inside the building Frog-Man came to the aid of his allies, but was kicked in the gut by Crossbones, who escaped after throwing a grenade at Gravity, whose detonation was blocked by Geiger. Gravity didn't want to talk to Frog-Man about how he had stopped Crossbones' bullets when Geiger was brought away in an ambulance and told Frog-Man to just leave him alone. Moments later Frog-Man witnessed Gravity quit. (Fear Itself: Youth in Revolt#5) - Frog-Man and other heroes went to Las Vegas to aid the Iniative members there to help civilians. Frog-Man saved the Desert Stars' Johnny Cool from a fire. (Fear Itself: Youth in Revolt#6) - When Thor Girl became the Designate Frog-Man and the rest of the Initiative jumped into battle against her. They eventually realized that she wasn't even fighting back and she left for outer space after telling that that humanity was not worthy. Afterward Frog-Man wondered what this all meant for them and Prodigy told him that they would prove her wrong. (Spider-Island: Avengers#1) - When Flag-Smasher led ULTIMATUM in an attack on the UN Building Eugene put on his costume to help. Encountering Ms. Marvel he pointed out that he was a fellow Avenger as part of the Initiative's Action Pack (did they let him join after the Skrull version was killed...the Skrull version was a bit more competent than Eugene). Ms. Marvel allowed Frog-Man to come along and he got a chance to work together with her, Hawkeye and Jessica Jones to stop ULTIMATUM from destroying the UN Building with a massive bomb. He ultimately saved Hawkeye's life by throwing up on the spider-powered Flag-Smasher, who tried to kill Hawkeye with his mace. Frog-Man asked the others if he was Avengers material and Ms. Marvel told him that he absolutely almost was. Comments: Created by J.M. DeMatteis, Kerry Gammill, and Mike Esposito. His random bouncing is often useless (unless he crashes against the villain, which scores him a sure win). Leap-Frog/Dad had never met, let alone fought, Spider-Man before Marvel Team-Up#121. However, this story establishes them as old sparring partners. Leap-Frog fought Daredevil twice, the Defenders once, and Iron Man once. The Official Handbook of the Marvel Universe#4 even makes reference to the fact that he only had three fights before going to prison (they left out the Defenders story, though that wasn't really a super-villain confrontation). So, you have to ret-con in a bunch, or at least a couple, of old Spidey-Leap-Frog fights. They show a picture of them, so I guess that's one, anyway. Not that big a deal. Different costume. Leap-Frog only ever wore one costume, which is the one Eugene used to become Frogman in MTU#121--artistic license? Frog-Man had the questionable honor to be one of the characters killed by the Hulk in War is Heck, an alternate Earth recount of events by Uatu, in World War Hulk: Front Line#4 (November, 2007) by Paul Jenkins (writer) & Chris Moreno (artist). The above and other things were explained in Eugene's entry in OHotMU 2006#4. Eugene was revealed as the Frog-Man in Punisher War Journal and Action Pack in his OHOTMU Hardcover#4 entry. The Action Pack Frog-Man eventually turned out to be a Skrull imposter! Profile by Henrique Ferreira, courtesy of Spider-Fan, update by Snood. Post-2009 update by Markus Raymond. Toad, member of the Brotherhood of Mutants and former ally of Eugene in the misfits, @ X-Men I#4.